On Sunday my boyfriend texted me "Tomorrow, dinner reservation at 9, I'll pick you up at 8.30". I love surprises, so my Monday felt a whole lot better than usual. When I got home after uni, I spent some time getting ready and deciding what to wear. In the end, I went for a black silk shirt, high waisted black jeans, my new heels from Zara and some simple gold jewelry. 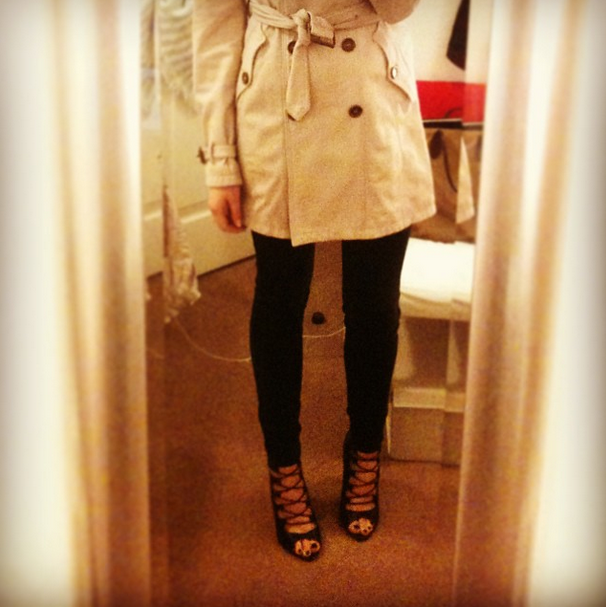 For the occasion I also wore my Burberry coat for the first time, which I love very much. At 8.30, my boyfriend picked me up and we grabbed a cab. The longer we drove, the more I knew where we would be going... Nobu is no doubt one of my favourite restaurants in the world. Being one of London's best Japanese restaurants, it's hard not to love Nobu. So you can understand how excited I was when we stopped outside of Nobu Park Lane! I subtly tried to take pictures of some of the dishes we had. Everything was delicious but I do have some favourites. To start, we had tuna tataki with ponzu (I didn't take pictures of this) and beef tenderloin tataki with ponzu and garlic chips. I'm obsessed with the ponzu sauce (soy sauce, lemon juice and rice vinegar), it's so good! Then we had some California rolls and two pieces of O-Toro sushi, which comes from the fatty belly of tuna. The rolls were good but the O-Toro fish was exceptional, it was so soft it just melted away in my mouth, amazing! Next up is both my boyfriend's and my favourite dish: black cod with miso. I've had this at other Japanese restaurants in London (like Roka), but the best one I've had is at Nobu. It's very soft, almost buttery white fish with a sweet, charred miso layer around it. Absolutely delicious, you have to take this when you see this on the menu anywhere, especially at Nobu! Next we had lobster with wasabi pepper sauce, which came out a little different than we expected. The wasabi taste was too subtle, but I liked that it came with shii-take mushrooms because they are my favourite. The sauce was very tasty. Lastly, we had the beef toban yaki, which came in sizzling hot and steamy. It was good, but not exceptional. I had beef tenderloin with teriyaki sauce and with wasabi pepper sauce once which tasted better than this beef toban yaki. To finish off I had a green tea iced tea and he had a cappuccino. If we hadn't eaten that much, I would have definitely taken the bento box with green tea ice cream and the best chocolate fondant ever. It was the perfect evening, with the most delicious food and of course the best company I could ask for :) The best Monday I've ever had!